Dr. Melissa Richman received her Bachelor of Arts in psychology from Pepperdine University in 1991, a Master’s degree in Social Work from the University of Southern California in 1994 with a concentration in mental health, and her Doctor of Psychology in 2001. She received her LCSW from the Board of Behavioral Science Examiners in 1997, and served as a Clinical Social Worker and Psychiatric Social Worker in local hospitals such as Northridge Hospital and Cedars Sinai Medical Center from that point. In addition, Dr. Richman supervised and managed an Addiction/Mental Health program at Cedars Sinai Medical Center from 1998-2000. 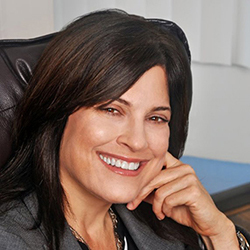 Dr. Richman has also had experience in business healthcare where she consults for healthcare companies assisting practitioners throughout California to work with the managed care system. Before entering private practices full time in Los Angeles early in 2000, Dr. Richman met “DAPA” criteria, becoming a Diplomate through the American Psychotherapy Association. Dr. Richman’s background is extensive. Throughout the years, Dr. Richman has worked not only with all forms of addiction, but also with the severe and persistently mentally ill at Camarillo State Mental Hospital, Los Angeles County Mental Health, and children afflicted with mental illness in foster care. Dr. Richman ran a live Internet radio show called Shrinkwrap back in 2000 and was also a frequent contributor to E! True Hollywood Story. Nurturing, nonjudgmental understanding, respect and honesty are at the heart of the therapeutic relationship I hope to develop with you. I believe that these deepest principles are the root of healing and recovery. The therapeutic relationship is where and how this takes place. When we address it in the here and now, then it most often generalizes to the present and future of your life. The foundation of my private practice lies in fostering this experience. Psychotherapy is a microcosm of life. What goes on in the world for you will eventually go on in the therapy relationship. The therapy creates a place to relax defenses and see patterns from childhood and life events that have interfered in having a happy life. I act as a "corrective relational partner" during the psychotherapy. I will help you awaken to the origin of and the interplay of how patterns and themes are causing pain and discomfort in your life and relationships. Therapy is expensive and time consuming but I feel you are worth it. Dr. Richman specializes in personality and addiction, but also sees a variety of clients including families, adolescents, adults, and couples in her private practice facing relationship problems, depression, anger, and anxiety issues. She has a focus in working with couples going through divorce and working with family law attorneys in a “Curative” and “Collaborative” process. American Express, Cash, Check, Discover, MasterCard and Visa.